As WATERFLY sports fanny pack aroused great interest of customers once it appeared on the market, now it has won thousands of great reviews on Amazon for its superior quality, fashionable design and affordable price. WATERFLY launched an upgraded waist bag on April 2018, which is named WATERFLY sports fanny pack G2, that’s really another big creation of WATERFLY! As a die-hard fan of WATERFLY, I bought both the 2 fanny packs as they are new on the market. While after wearing them for several months, I have found some differences including advantages and disadvantages between them. Here I’m so glad and fortunate to share my review with you. When it comes to the appearance, both the 2 fanny packs look fashionable and minimalist. Except for the WATERFLY brand logo and letters on the front pockets, there is no needless pattern or figure on the bag, which is perfect to show the concise design of WATERFLY. As WATERFLY advocates sport, casual and fashionable style, the materials of their bag are always picked considerately to ensure its durability, breathability and comfort. Both the 2 sports fanny packs are made of 100% water resistant nylon material outside and 100% polyester material inside, which are really wear resistant and lightweight for daily wearing. As for the breathability, it is obvious that fanny pack G2 is superior to G1, for the backside of G2 is made of mesh material with sponge pad inside, extremely breathable and comfortable to wear. You can see the contact surface of the 2 bags in the right pictures. To verify the water resistant performance of these bags, I splashed some waterdrops on both the 2 bags and found the water float on the surface just like water drops on a lotus leaf, and the bag surface and lining are completely dry after I shaking the bag and wiping the water by tissues. The second time I sprayed some water on the surface and press the water and found it permeated in the bag, the lining is a little moist but no obvious water inside. That means these bags can be used in light rains but can’t stand heavy rains. The biggest difference between the 2 bags at the first sight is the capacity, it is evident that G2 is larger than G1, and that is really. G1 is comparative compact, but the net weight is only 0.33lb./150G, ultra-light for both men and women. It is compatible with all smartphones with a screen size of 5.5”. The main pouch can hold iPhone 8/8 Plus/X, Samsung S5, S6, wallet, sunglasses, etc., but there is no compartment, only a main pouch; while the 2 front pockets are ideal for tissues, earphones, coins or changes, etc. ; the backside pocket is designed for cash, tickets, cards and other valuables. The net weight of G2 is 0.39lb./175g, not heavy actually. There are 5 separate zipper pockets in total, ideal to organize your necessities separately; while 4 compartments in the main pouch allow you to keep your phone (up to 6.5”), keys, cards separately without scratching your phone screen. Also, there are 2 pockets in the front and a compartment on the backside for small items. In my opinion, the slim line of WATERFLY fanny pack G1 is much suitable for women, while the larger capacity G2 is ideal for men. But that’s not absolutely, which bag you choose depends on your own need. Guess what makes me surprised besides the quality and trendy style? If you have ever bought WATERFLY sports bags, you might know what I am talking about. 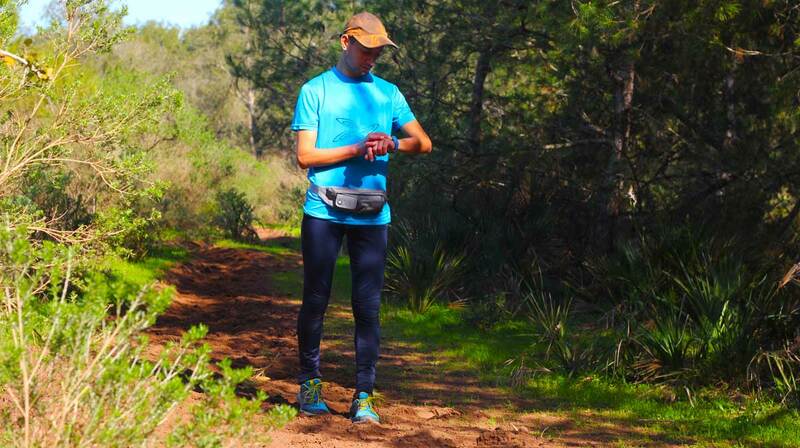 Yeah~ it is the small considerate design of WATERFLY fanny packs that impressed me most. Inside key hanging hook can keep the keys organized in the bag, you’ll no longer search for your keys in the whole pocket. What is worth to be mentioned is that there is an earphone hole on the side of G2, which provides an easy access to the earphones, so you can enjoy music freely while running, cycling or walking. I like this design especially. Last but not the least, the price is always what most people care about. Now the 2 sports fanny packs are unbelievably affordable in WATERFLY SHOP, G1 is available in 8 colors for only $12.99 USD, while G2 is available in 6 colors for only $17.99 USD. If you are finding a fanny pack now, WATERFLY is your best choice! WATERFLY sports fanny pack G1 and G2 respectively has its pros and cons, if you are an outdoor enthusiast, it is really necessary to pick one fanny bag as your outdoor companion to keep your necessities and let your hands-free. Never miss such awesome fanny packs! (*^▽^*)Thanks for your support! Welcome to bookmark and share my blog with your friends! Thank you for sharing excellent information. Your site is so cool. I am impressed by the details that you’ve on this site. You, my pal, ROCK! I found just the information I already searched everywhere and just couldn’t come across. What a perfect website. I do not even understand how I stopped up here, but I believed this publish was once great. I do not know who you might be however definitely you are going to a famous blogger should you are not already 😉 Cheers! Thank you so much for your support! We’ll keep trying!